The Hoary bat is the one that can claim the title of the largest bat in Kentucky. This bat can reach lengths over 5 ½ inches and a large wingspan of almost 16 inches. Most of these bats are brown in color and have a yellowish color around their throat area. The fun is thick and brightly tipped with a silvery-white color (most prominent on the chest and back). The wing membranes are mostly black which gives this bat a distinct look when the wings are outstretched. 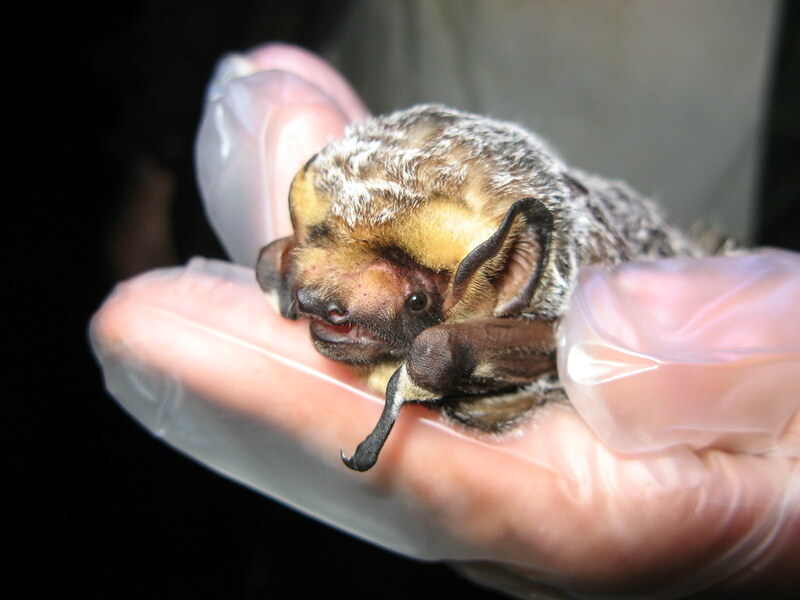 The hoary bat covers most of its’ body including the ears and tail membranes. The Hoary bat has the most widespread range of any bat in North America. They are found as far north as north-central Canada and as far sound as southern Mexico. There are numerous records of them throughout Kentucky and it is mostly in the summer. It is believed that they likely pass through during migration as well and they are not known to overwinter in Kentucky. This species is known to be a solitary one that lives in the forest. Hoary bats are a hardy species that can withstand colder conditions than other bats due to their thick fur. They are usually observed roosting under leaf clusters during the spring, summer, and fall. Not much is known about their hibernation sites, but they are believed to hibernate in hollow trees and buildings. It is also thought that they migrate south where they are able to remain active all year long. Females have litters of two pups anywhere from mid-May to Early July and are not known to form maternity colonies as other bat species. These bats forage on a lot of different flying insects as they forage along woodland openings, woodland edges, and within water corridors.